This entry was posted on August 3, 2013 at 4:57 pm and is filed under 1979, 1980s, Music, Rock, Uncategorized with tags But The Little Girls Understand, Classic Rock, Get the Knack, hard rock, The 1970s, The 1980s, The Knack. You can follow any responses to this entry through the RSS 2.0 feed. You can leave a response, or trackback from your own site. 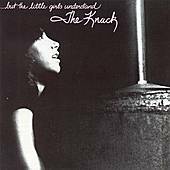 I’ve always desperately wanted this one and the third Knack album to be great given how much I loved (and still love: http://victimofthefury.com/2012/08/25/a-wiggle-and-a-wink-getting-the-knack/) the first record, but I’ve never give either one a shot for fear of suffering a big let down. Your post makes me think I should at least give them a try now these roughly 30 years later. Nice post! Love this album even though it does suffer from the “it needs to sound like the blockbuster debut” syndrome. The same can’t be said for their third album, “Round Trip,” which works to its advantage. I think they knew it wouldn’t be a hit so they just did what made them happy…and I consider it an undervalued gem. Their later albums after they reunited, as well as Doug Fieger’s solo material, are worth exploring too. Great post. Enjoy your holiday (or vacation, as we call it here in the US). Thanks Kramer, I’m back from my holiday, actually it’s a temporary reprise as I’m going to visit the in laws next week. I think you have something about the “it needs to sound like the debut” syndrome.